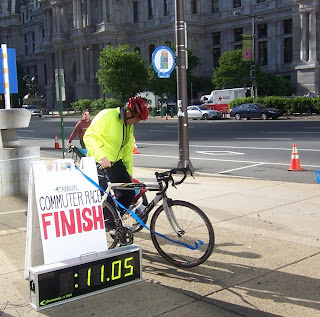 Greater Philadelphia Bicycle News: 10:49! 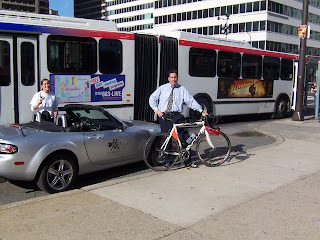 Congratulations to Pat Cunnane who handily won todays Commuter Challenge travelling from 45th and Spruce to the Municipal Services Building (across the street from City Hall) in just ten minutes and forty nine seconds. Thanks to Jim Mohan Director of the Woodbury Relays and Somerdale, NJ FD for supplying the race clock and generator. And to PhillyCarShare and Fuji Bikes for helping to make this race possible. why didn't the septa commuter walk to 45/baltimore and take the trolley? or to 46/market and take the El? seems like those would be faster than the 42. or even up the chestnut for the 21, avoiding the HUP loop?